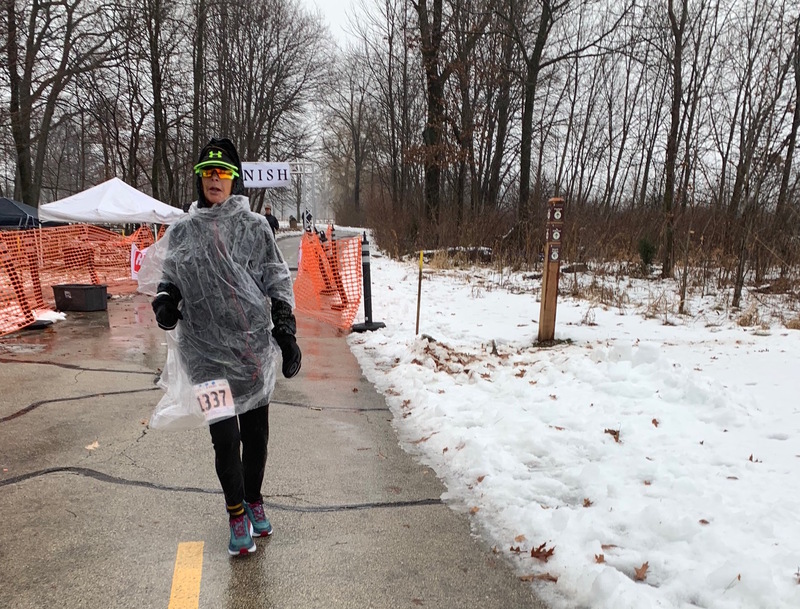 On Saturday, the Chicagoland area kicked off winter racing with the Arctic Frog Endurance races held at Independence Grove Forest Preserve in Libertyville, a northern suburb of Chicago. 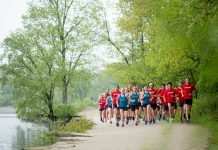 Just shy of an hour drive from the city, this race is nestled in one of the trendier suburbs, which showcases a downtown filled with restaurants, shops, and parks. Independence Grove is a forest preserve that is owned and managed by the Lake County Forest Preserves. It is kept in pristine condition and incorporates tree lined, paved trails along with bridges and even a small pond. The Arctic Frog Races are organized by FrogHops Sports, a veteran-owned, multi-sport company, owned by Ray Letada, a retired U.S. Navy Chief Hospital Corpsman, a former Navy Diver, Naval Parachutist, and a combat veteran of Operations Enduring and Iraqi Freedom. Ray hosts three races each year, and is frequently at other races volunteering and cheering on fellow runners. 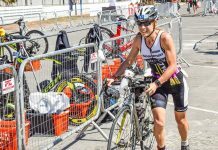 This race series offered a 15K, 25K, and 50K distance option. 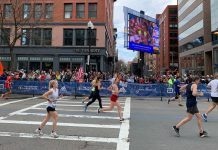 The races started together at 8 a.m. and all racers followed the same five-mile loop. The course began near the forest preserve pavilion so racers could enjoy heated bathrooms with indoor plumbing at the start/finish line. The first mile and a half allowed runners to ease into the loop with clear trails and almost no elevation. After that warm up, runners were faced with about two and a half miles of snow and ice packed trails. There were a few hills, but nothing too challenging, as far as elevation was concerned. The real challenge was in trying to stay upright on slippery and uneven terrain, with gusty winds, chilly rain, and patches of sleet. The course looped out and back with an aid station in the middle, so runners were never far from replenishment and assistance, if needed. The last mile of the course was again pure trail, free from snow and ice. I ran the 25K, which was three loops. The rain held off until about 45 minutes in which found me on my second loop. It then stayed steady for the rest of my time on the trail, making for a tough race overall. There were moments of sleet coupled with the rain which left my face numb by the end of the race. But, the race staff and volunteers were incredible. They had coffee, hot chocolate, water, and lots of food choices. There was also a warming tent with a portable heater at the start/finish line where runners could warm up and dry off. There was a changing tent for those runners that wanted to change close to the start/finish line, but, like I mentioned above, the heated bathrooms gave a much better option. On a cold, rainy day, it’s well worth an extra five minutes to walk to a heated changing area, rather than a cold tent. As with all FrogHops Sports events, the Arctic Frog races were well-organized and an overall great event for runners. All runners received a long sleeved cotton t-shirt, an aluminum water bottle, and a super cute frog medal. Results were not yet posted at the time this article was written.